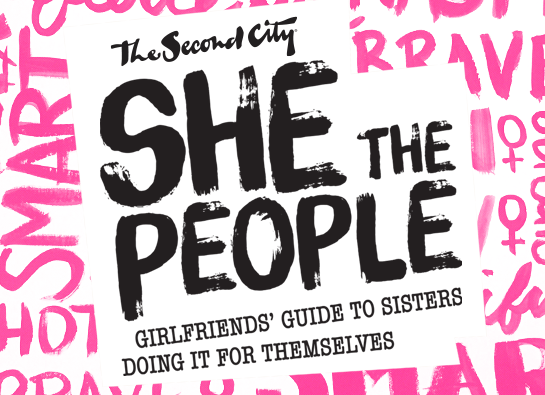 Joining the cast of SHE THE PEOPLE at The Second City Apr 6 thru May 27, 2018! I'm thrilled to join the hilarious all-female cast of the critically acclaimed sketch comedy show SHE THE PEOPLE in the UP Comedy Club at The Second City! Come see me Thursdays through Saturdays at 8pm and Sundays at 7pm from April 6th-May 27th. Get yo tickets HERE. 2/20/18: Kohl's commercial voiceover booking! Everything active for yo fam. Countdown to United Solo in NYC on 9/16/17 at 9pm! My solo comedy show Token will be performed in New York City on SATURDAY, SEPTEMBER 16, 2017 @ 9:00pm as part of the United Solo Theatre Festival. It's a great time slot to perform on Theatre Row so come out and bring a date...or two...or five: the Studio Theatre on Theatre Row: 410 W 42nd St. Get tickets HERE. See Token at the Out of Bounds Comedy Festival in Austin, TX Sept 1 & 2, 2017! Dope; it's here and I'm super excited! Token is heading to the coolest city in the Lone Star state and I'm keeping it weird. Get tickets for my shows in Austin (9/1 @ 7:15pm and 9/2 at 7pm) at Out of Bounds HERE. Hoods and PEACEBOOK Review in the Chicago Tribune! PEACEBOOK Festival kicked off with an inspirational bang last Saturday at the Goodman Theatre and the festival as well as my original play HOODS received a great review in the Chicago Tribune! Read the review HERE. Support the Chicago peace movement and come see HOODS and the rest of the amazing performances in PEACEBOOK Festival FOR FREE at Hamilton Park in Englewood Oct. 5, 6, 7. More info and tickets HERE. Me playing Bronzeville in my original play HOODS at the Goodman Theatre on August 26, 2017. My play Hoods in Collaboraction Theater's PEACEBOOK FESTIVAL premieres at the Goodman Theatre on August 26th at 3pm! 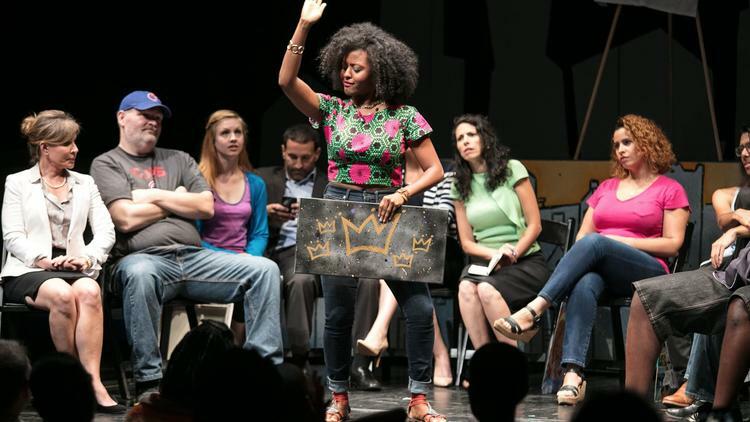 The second annual Peacebook Festival is a collection of 24 plays and devised pieces centering around bringing peace to the city of Chicago. The fest will premiere in the Goodman's Owen Theatre and then will split into three, eight-work compilations that will be performed at three different Chicago Park District locations in the fall. I wrote and act in a serio-comedy piece titled Hoods. The play shows the "Chicago family"; ten individuals who are the personification of 10 unique neighborhoods in Chicago. They are in a family therapy session in hopes of healing their long-standing family issues. Hoods opens the festival at the Goodman on August 26 at 3pm and will also open the festival at Hamilton Park in Englewood, October 5-7th. For more info and FREE tickets for Peacebook, click HERE. I'll be performing a condensed version of the show at UCB on Sunset Blvd. in LA on Thursday, August 24th. Tickets are only $5!!!! Whaaa? 6/20/17: Allstate voiceover booking (with Dennis Haysbert)! Unfortunately I can't post the audio of this radio/internet commercial due to contractual obligations but keep your ears open for this spot on your local radio stations and/or on Spotify commercial breaks. It's the one with the Allstate guy and a bratty teenager debating about FOMO. Clearly, I'm the bratty teenager. Token at the Out of Bounds Comedy Festival in Austin, TX Sept 1 & 2, 2017! Dope! Super excited! Token is heading to the coolest city in the Lone Star state and I'm keeping it weird. Get tickets for my show at Out of Bounds HERE. Token is invited to United Solo Festival in NYC! My original solo show is also heading to New York City! It was accepted into the 2017 United Solo Theatre Festival. I'll be performing it SATURDAY, SEPTEMBER 16, 2017 @ 9:00pm. If you're in NYC, come out! Buy tickets HERE. See all press coverage for Token by clicking HERE. "It is as charming as it can be!" "This is going to be a very, very big talent." "See her now before she shows up on Saturday Night Live!" Token sold out its run at The Beat Lounge at The Second City TC May 19-June 9!